Sherry Boat is proud of its 60 spacious standard & superior cabins and 1 deluxe cabin in addition to 2 large suites offering you the highest standard of comfort on a cruising boat. All cabins have individually controlled central air-conditioning, a hair drier, IDD telephone, a TV set & video and musical channels. Standard are equipped with 2 beds that convert into queen size bed & sofa-bed giving the possibility of having a triple cosy accommodation & a sitting area. 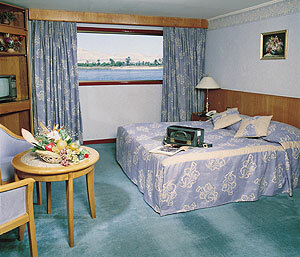 Superior cabins are like the standard cabins but are located on the main and upper decks. 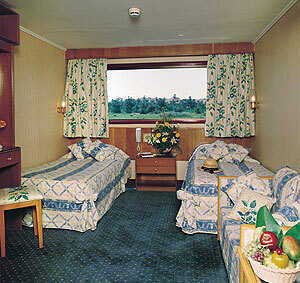 The Deluxe cabin offers 2 double beds and a vanity dresser. 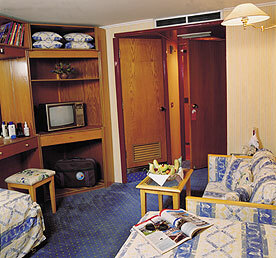 Suites offer one large bed in a spacious room.